The iPhone 4's first pre-ordering day has been a total disaster. AT&T's online system has collapsed, there are account security breaches, Apple's online upgrades are down, and stores are now using pen and paper to process sales. They're just using some web interface, not the exact same customers are using online, but not much better. It's probably the same servers. Basically, they were getting one pre-order thru every 20 minutes. They said the problem was system wide. Here's how it worked: They just kept mashing on the 'submit' button and getting error after error. On the umpteenth try, it'd go through and then the next step, whatever that was, would get error after error. After a long time, it would finally go through. What's worse is that the first step of the process reups your 2 year contract, so you can't walk away if you get fed up. I had to stick around until it went through, or i'd have a new contract but no subsidized phone. Update 1: Apple's processing system seems to be collapsed too. The reason: The iPhone upgrades depend on AT&T account server. This morning while trying to pre-order the iPhone 4 through AT&T website, my login brought me to a ‘website unavailable' screen. After a refresh it brought me to the phone upgrade page logged in under a different account, some dude from Lakewood OH! I am not sure if this e-mail is going to the correct place but this morning when trying to log in to my at&t account I entered my information and ended up in someone else's account with access to all their information. I feel as though someone could now be logged in to my account. To me, this seems like a huge security breach and at&t is shrugging me off as if it is no big deal and I feel that it is. I just thought with the recent i-pad breach that this one is an even bigger one and I wanted to bring it to your attention. Update 3: Reader Bryan Tipton says that AT&T has taken down its system completely, presumably to avoid the security errors and the frustrating experience. Update 4: Just when you thought things couldn't get any worse, reader Jonathan Alvarez reports that AT&T stores are not processing orders right now, just taking credit cards and phone numbers. I just left the AT&T store in Oakbrook, IL and they're not even processing orders now. They are imprinting credit cards and calling customers back over the phone when their systems get back up. I'm going through Apple's processes. It showed my eligibility then crapped out. Update 6: People are reporting success at Best Buy stores. Apparently, they are not using AT&T live servers, but their own ordering system even if you are upgrading an existing account. Most probably they will use a batch process later in the day, to run all order through AT&T servers. Not a bad idea when you need to deal with massive transactions. Update 7: Horror tales keep coming in. A reader reports a purchase process that took almost three hours, and how the AT&T store started to imprint credit card slips and processing orders "on pen and paper." 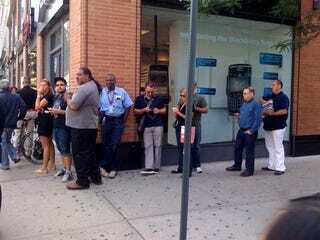 Came to Wall St AT&T store this morning around 7:30 AM. Stood in line for about 15-20 minutes, everything seemed to have been proceeding smoothly. Then literally right before our eyes the systems started disintegrating. We started my upgrade order process around 7:50, finished it around 10:20AM, and I felt lucky. Multiple credit card denies, weird address verification messages - wanted to ship IPhones to work - fugetaboutit. One consistent error kept coming up "Too many something something in the queue, max number is 256". I think this is related to the antiquated ordering system they use (the same Web-browser based one that we do just via a slightly different backend). By the time I left they pulled out the credit card imprinting slips - I believe that they were going to start processing orders on pen and paper when I left. Um, I tried to to pre-order my iPhone 4 from my local Plainfield, IL ATT store because I couldn't do it online, and they're just closing down the store now. No one can come in, and they are not accepting an pre orders right now. I'm pretty pissed right now. I tried pre-ordering from the att site this morning about 5:50 am cst. I ordered 3 times because the connection timed-out when submitted the payment. Assuming payment was not accepted. Now my CC was billed $300 3 TIMES and According to the ATT site I cannot upgrade to an iphone or any phone till Feb 2nd of 2012.... wtf? Update 12: Some readers are reporting success through the new iPhone Apple Store app, but the confirmation show that they are pre-ordering the $699 iPhone, not the upgrade-priced one. This problem seems to be caused by the lack of connection to the AT&T servers. I think they're bypassing the upgrade check altogether if you reserve your phone through the iPhone Apple Store app. I never had to check for upgrade status and the confirmation email shows that I'm reserved for a $699 iPhone. I imagine this will be easy enough to sort out when I get there, so I'm fine with that. Just an update for you from Memphis. TN. In less than 15 minutes, was able to walk into AT&T store, update my contract, order a 16GB Black iPhone, right at 12:00 p.m. CDT. Only problem is AT&T is now showing a 2-3 week backorder for my phone. Update 14: Some readers are reporting success in ordering from Apple. At this time (3:33PM EDT) nobody in Gizmodo can access the AT&T eligibility page. Update 15: Major update: Exclusive: iPhone 4 order security breach exposes private information. Update 16: Some readers, like Ashley Conne, are reporting problems ordering the iPhone 4 with the new Apple Store App. Update 17: Several readers are still sending emails detailing different horror stories and error messages on AT&T website. AT&T wouldn't let me complete the order on their site, so I had to go to my AT&T store. Big news, I was there for three hours before they began writing contracts and credit card receipts by hand. They said their systems across the US were down. They'll call me to confirm my pre-order once their systems are back up and they can put me in. What a f***ing mess. I got out of there about an hour ago. Lots of people still in line for hand-written contracts and orders. Update 18: Readers are writing in to say that the iPhone is now backordered. Placed my pre-order for my 32gb iPhone this morning through AT&T's Website. I checked the order status after i found out about all the problems and it is listed as backordered. Not sure if it is listed this on purpose because it is a pre-order or if it will actually be on backorder on the 24th. Update 19: The problems are not only AT&T and Apple's. Some readers are reporting horror stories at Radio Shack. Apparently, orders are not going through, so you better check twice if you have used them to order your iPhone 4. Chaos ensued, with phone calls to corporate, reports of "sold out"
and call me to confirm. Still awaiting that phone call. Two friends successfully did it with the "add a new line" on the website, but he pointed out that it didn't ask for his name. Apparently you don't even need a name? How are they going to pick up their pre-ordered phones if Apple doesn't know who they are? Click to viewKnowing the interest in every new Apple iPhone, and knowing that there are millions of people eligible for this—admittedly very attractive upgrade—how could this be? How could AT&T not expect this kind of massive load on their servers? Perhaps they used the same prediction software they use to plan their cellular network.